San Francisco, 1966, the Summer Of Love … it was all of that, much more and much less. When one thinks of the music scene that flourished during that year, one usually thinks of that the artists were from the Haight Ashbury District, when in fact, most of them, nearly all who became legends, transplanted themselves to The Haight, as it was the new youth and cultural center of the universe. Groups like The Grateful Dead, Steve Miller, Big Brother and The Holding Company, Santana, Canned Heat, and others quickly established themselves and rose to the surface as spokesmen for their generation … but truth be told, for every Jefferson Airplane or Grateful Dead, there were dozens of great bands that made little more then a ripple, like H.P. Lovecraft, Ace Of Cups and the all but forgotten Moby Grape. 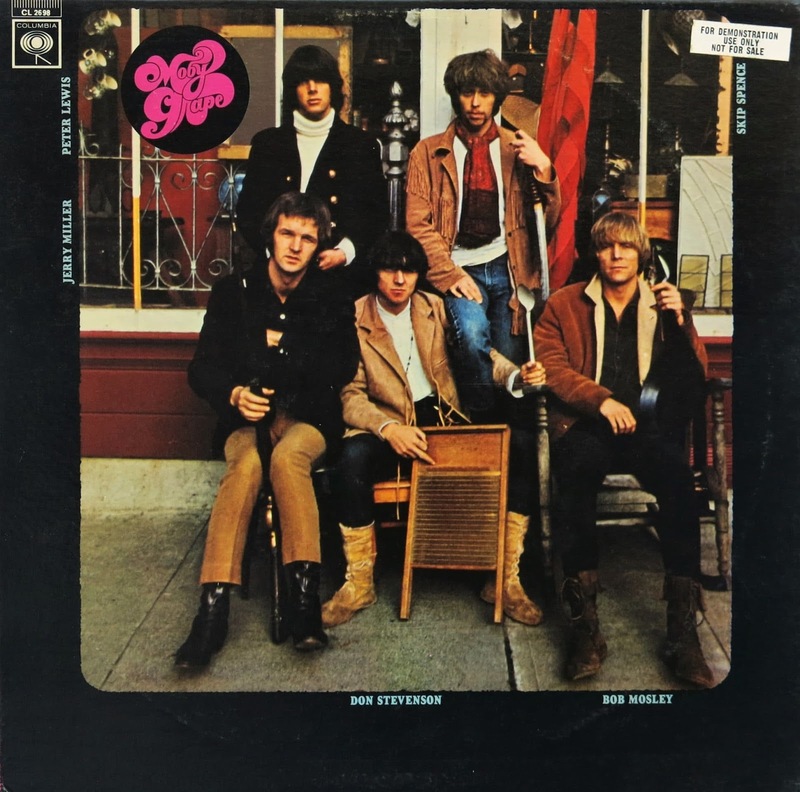 The story of Moby Grape is a strange one, one that runs parallel to that of Pink Floyd, and Roky Erickson … filled with love, anger, death, drugs and insanity. Moby Grape was not so much a band that came together out of friendship and the love of music, as they were incorporated, developed and built … but in the case of The Grape, that was not necessarily a bad thing, as they fast became good friends, relentlessly practicing and practicing, playing and playing, and developed the following of a band who would need to be reckoned with. Sadly Columbia, in all of their divine wisdom, put so much hype onto the band from the get go that they were doomed to failure … as hype was considered anti-establishment, needing to be finessed so that the hype was cool rather than a sales pitch. This hype came to a head, and the results can be seen on the cover of their 1967 album, where in true ‘prisoner of war’ fashion, the finger is given right to the camera … a statement that says, “We don’t dig what Columbia’s done, and this finger is testament to that!” thus reestablishing the fact that the band was cool and not just corporate puppets. The music of Moby Grape would fit well with the jam bands of today. Though all of the songs are short, they are exceedingly tight, up tempo, exciting, well thought out and reflected the manic energy of the times … being much more in line with what The Band was working out on the east coast. Every member wrote songs, every member could sing, there was tremendous talent within the ranks and they worked hard for every step they took. All the guys were playing melodies and counter melodies, and all that was balanced by rhythms there to for, unheard of. And yes, Moby Grape gained attention and a following on both coasts, as they toured non stop. I saw Moby Grape perform several times, and there was a magic to the shows that was only equaled by Buffalo Springfield, another group of guys for whom the music was everything. Eric Clapton has cited Jerry Miller as the best guitar player in the world … Led Zeppelin touted Jerry and the band as one of the reasons they came to San Francisco, and have even played Moby Grape songs in concert … Jerry had early work playing guitar on Bobby Fuller’s “I Fought The Law” … and still tours as the Jerry Miller Band, playing his and Moby Grape songs. But there were problems rising in the band, Spence would go insane, and recover enough to crawl into the bottle dying of alcohol related issues, another member, Bob Mosley joined the Marines, hoping to go to Vietnam, but was discharged and diagnosed with schizophrenia, he lived in a box on the streets for nearly thirty five years… no one is sure where he is now. 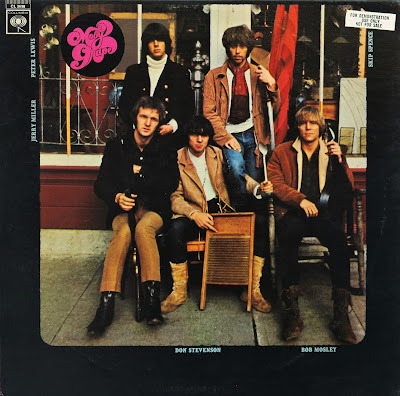 As they say, a candle that burns so brightly burns half as long … and while Moby Grape never achieved the success of the Quicksilver Messenger Service, they certainly should not be forgotten for the perfect music they laid down that summer in 1967. Question: Hey!!! What’s big and purple and swims in the ocean? Answer: “Moby Grape” … yes, that’s where the name came from, but these guys were not joking. *** The Fun Facts: The album art was photographed in front of Junktiques, and antique store on the main drag at 341 Bolinas Road, Fairfax, California. Bob Mosley currently lives in the Santa Cruz area with his wife. He used to sit in on a regular basis with alt country performer Larry Hosford at the Britannia Arms in Aptos, before Larry's passing a few years ago.